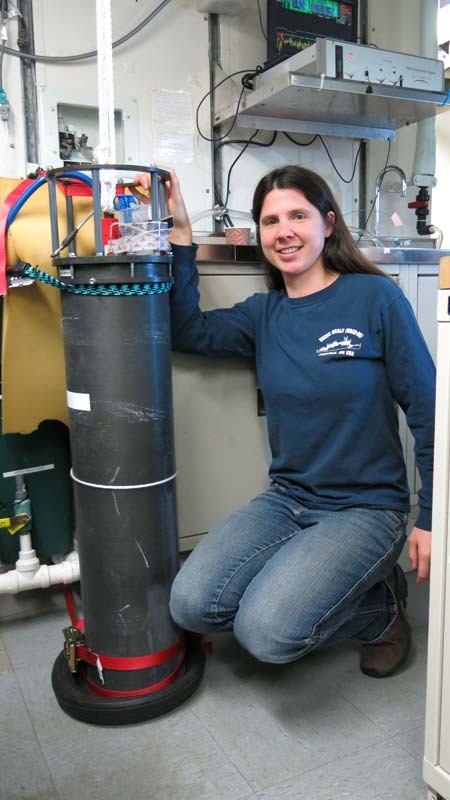 Emily Peacock is a Research Assistant with Dr. Heidi Sosik at the Woods Hole Oceanographic Institution (WHOI). 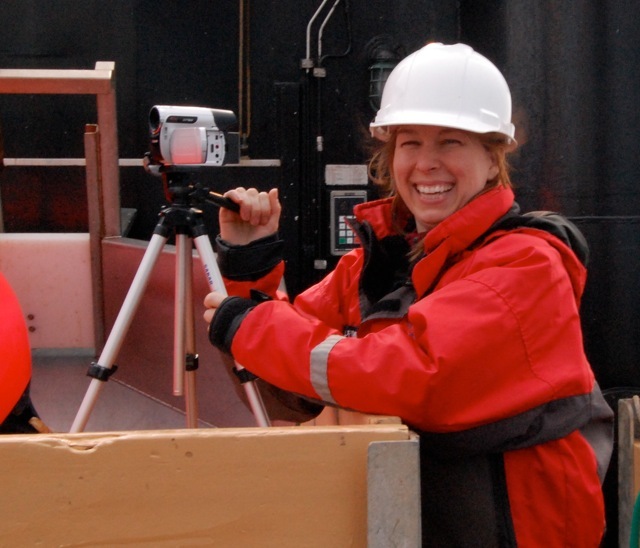 She is using imaging flow-cytometry to document the phytoplankton community structure along the NOAA Henry B. Bigelow Route. Phytoplankton are very important to marine ecosystems and are at the bottom of the food chain. They uptake carbon dioxide (CO2) and through the process of photosynthesis make oxygen, much like the trees of the more well-known rain forests. What tool do you use in your work you could not live without? 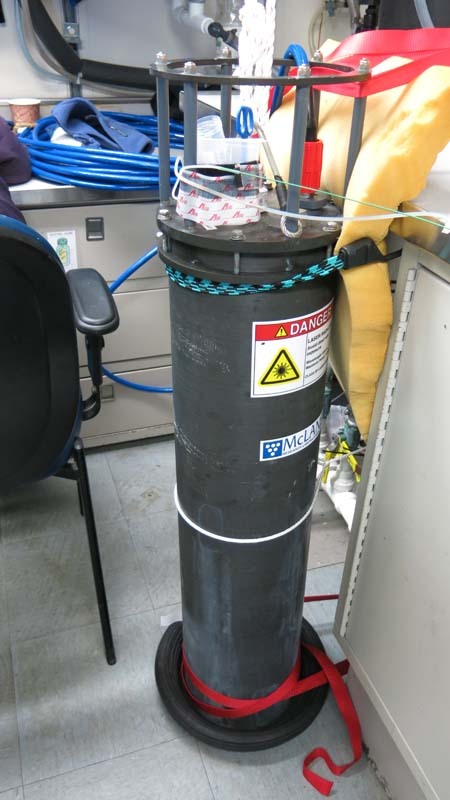 I am using an ImagingFlowCytobot (IFCB) to sample from the flow-through Scientific Seawater System. 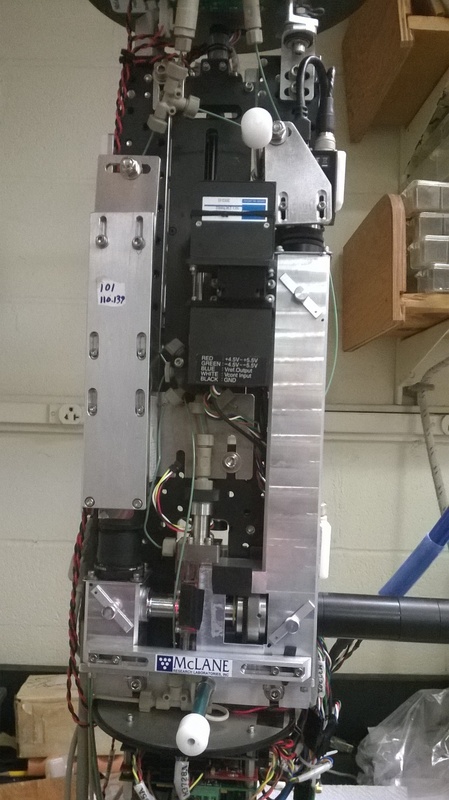 IFCB is an imaging flow cytometer that collects 5 ml of seawater at a time and images the phytoplankton in the sample. 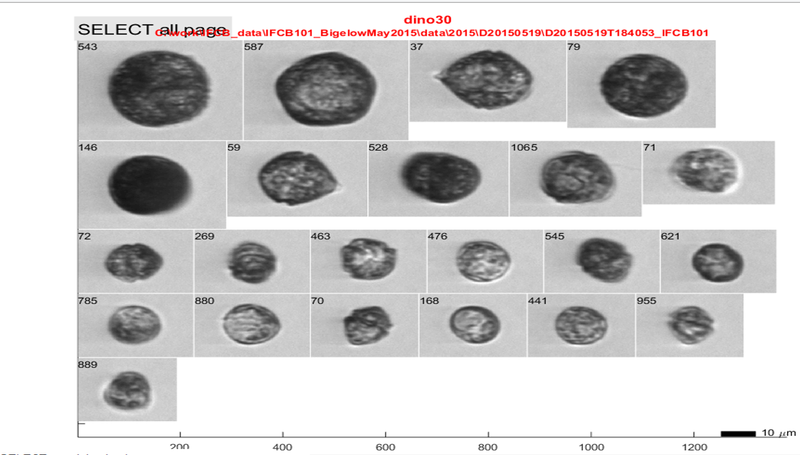 IFCB images anywhere from 10,000 phytoplankon/sample in coastal waters to ~200 in less productive water. 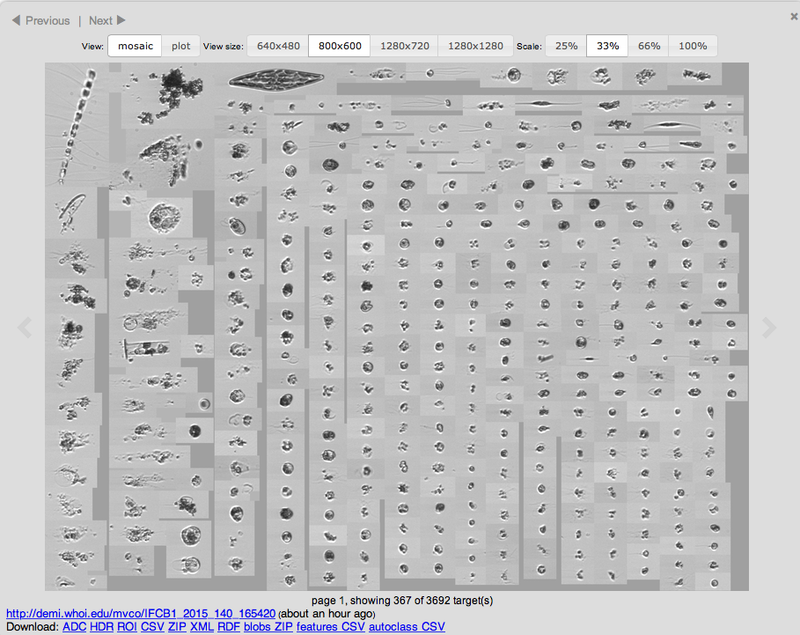 Emily is creating a sort of plankton database with all these images. They look fantastic, see below for sample images! 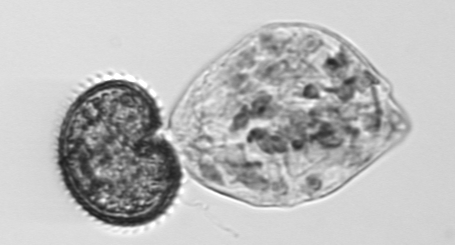 Microzooplankton called Ciliates. 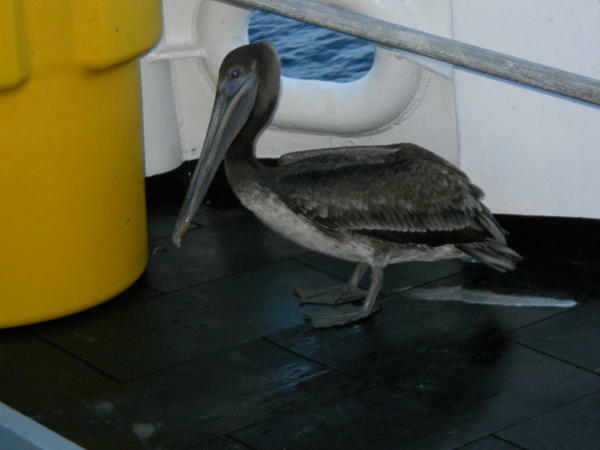 Photo Credit: IFCB, from this Henry Bigelow research cruise. 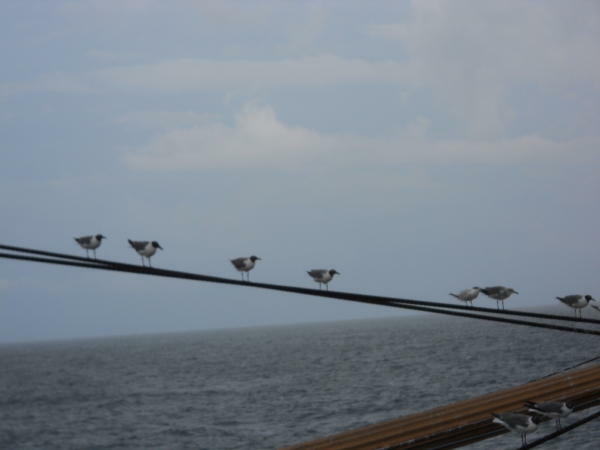 Photo Credit: IFCB, from this Henry Bigelow research cruise. 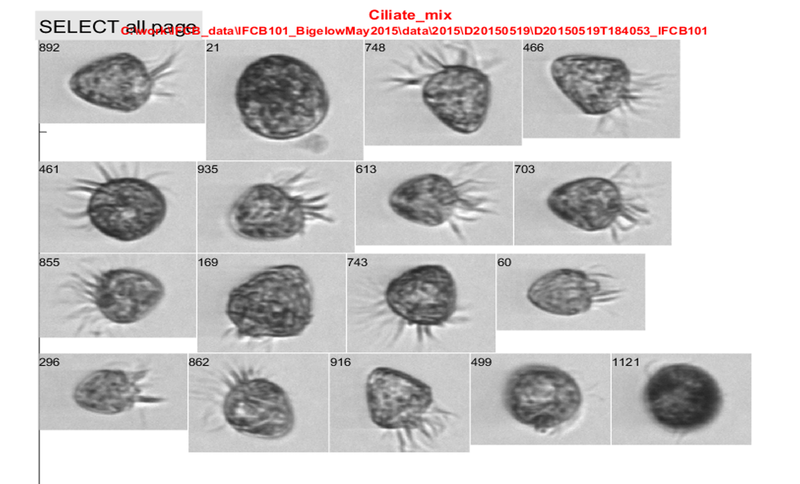 The IFCB “is a system that uses a combination of video and flow cytometric technology to both capture images of organisms for identification and measure chlorophyll fluorescence associated with each image. 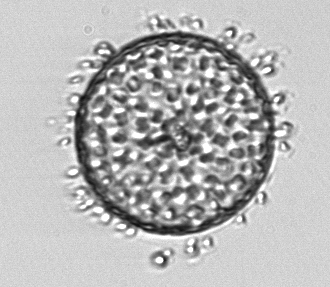 Images can be automatically classified with software, while the measurements of chlorophyll fluorescence make it possible to more efficiently analyze phytoplankton cells by triggering on chlorophyll-containing particles.” (WHOI ICFB 2015). I really enjoy looking at the phytoplankton images and identifying and looking for more unusual images that we don’t see as often. I particularly enjoy seeing plankton-plankton interactions and grazing of phytoplankton. What type of phytoplankton do you see? I am seeing a lot of dinoflagellates in the water today (May 20th, 2015), Ceratium specifically. 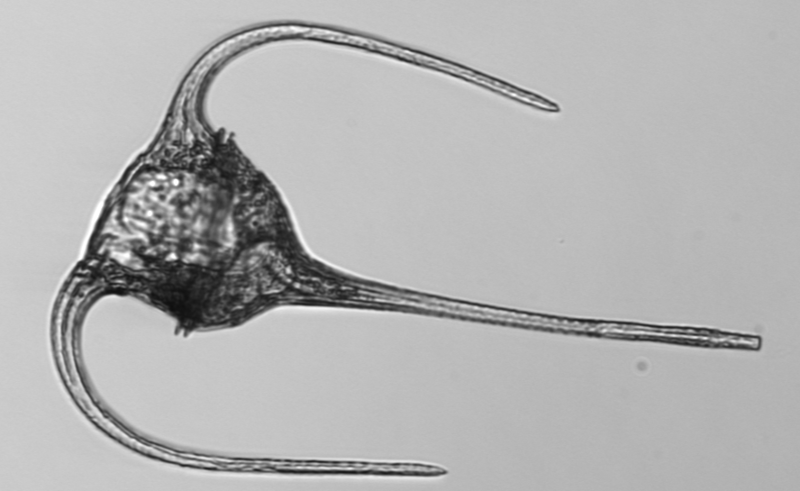 The most common types of plankton I see are: diatoms, dinoflagellates, and microzooplankton like ciliates. The general size range for the phytoplankton I am looking at is 5-200 microns. 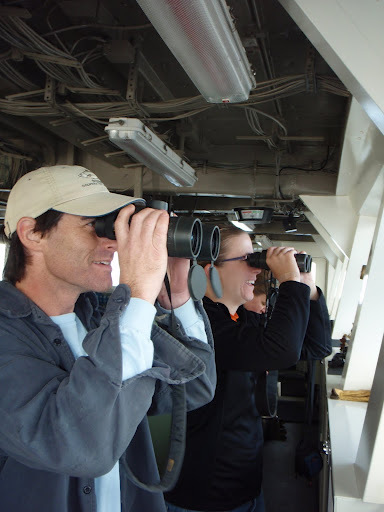 “The Martha’s Vineyard Coastal Observatory (MVCO) is a leading research and engineering facility operated by Woods Hole Oceanographic Institution. 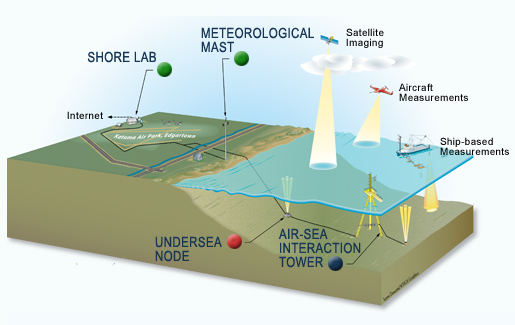 The observatory is located at South Beach, Massachusetts and there is a tower in the ocean a mile off the south shore of Martha’s Vineyard where it provides real time and archived coastal oceanographic and meteorological data for researchers, students and the general public.” (MVCO 2015). 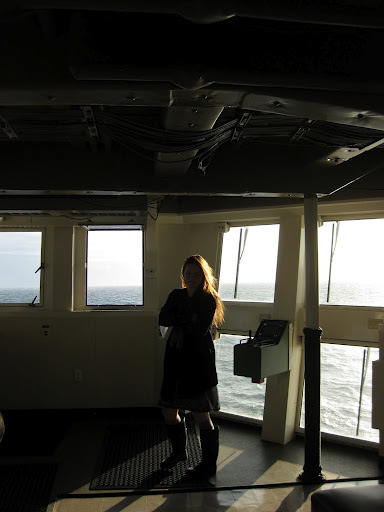 Most of my work with Heidi is at the Martha’s Vineyard Coastal Observatory. 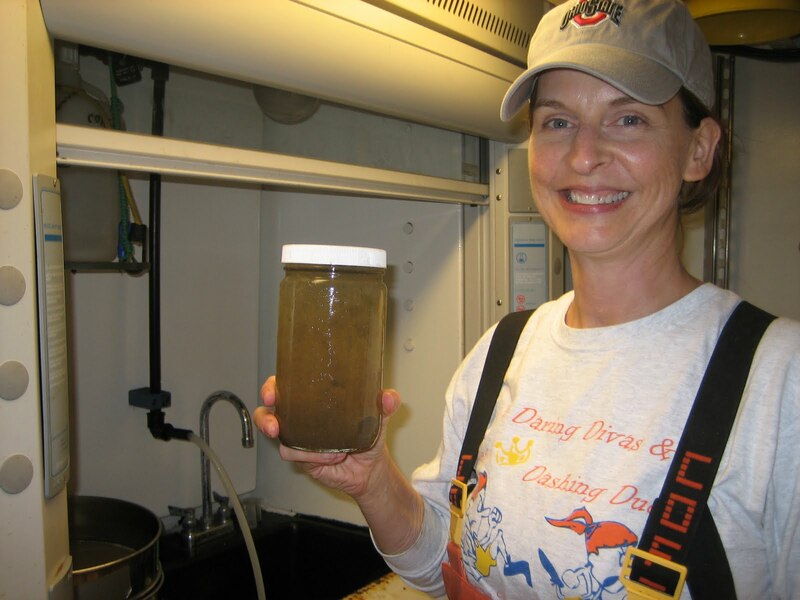 IFCB at MVCO has sampled phytoplankton every 20 minutes since 2006 (nearly continuously). This unique data set with high temporal resolution allows for observations not possible with monthly or weekly phytoplankton sampling. Below is an example from the MVCO from about an hour ago at 1 PM on May 20th, 2015. 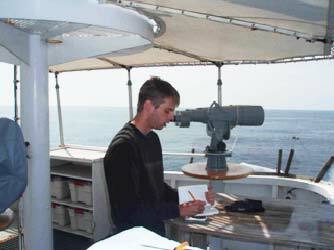 IFCB at Martha’s Vineyard Coastal Observatory has collected photos of nearby phytoplankton every 20 minutes since 2006 (9 years, almost continuously). With this time series, you can study changes in temporal and seasonal patterns in phytoplankton throughout the years. Somewhere back in my family history there must have been a fishmonger, because I’ve been channeling something or someone. 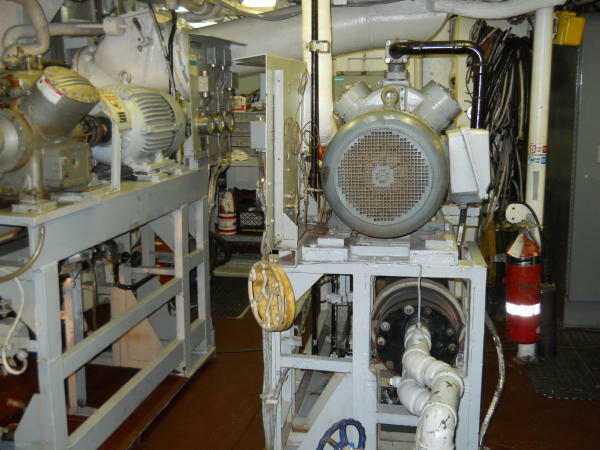 The entire process of watching the acoustic footprint of the ocean under the ship, deciding where to physically sample (trawl) populations, and then seeing and processing the fish that live 100 meters or more below us? Fascinating. 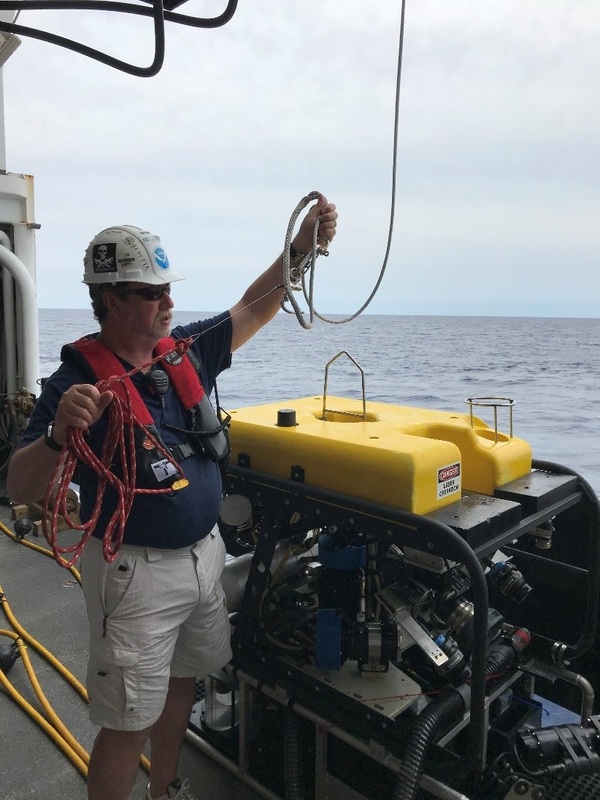 Add to this camera drops to get snapshots of the ocean floor (more amazing footage this morning), and interesting ‘Methot’ plankton tows to sample what is available for the fish to eat and give a more accurate and complete picture? How many adjectives can I use? Before we dive too far into the depths, let me explain/refresh what plankton are. Plankton are any drifting organisms that inhabit the water columns of bodies of water. 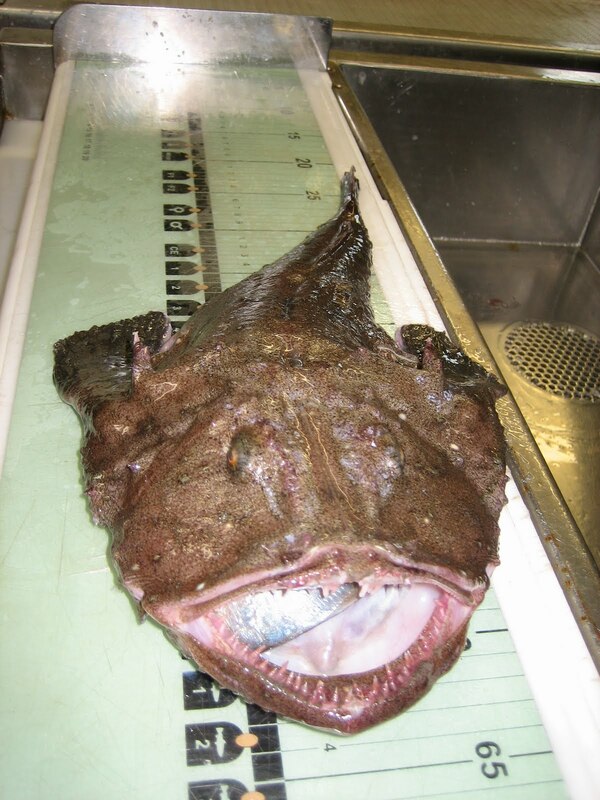 In fact, their name derives from the Greek for “wanderer,” and it would be helpful if you thought of them as drifters in the current…from deep in the ocean to up on the surface. They are generally broken down into plant-like-photosynthesizing plankton (phytoplankton) and animal-like plankton (zooplankton). Phytoplankton are “photosynthesizing microscopic organisms that inhabit the upper sunlit layer of almost alloceans and bodies of water” (wikipedia). If you have taken biology or forensics with me, I have described some of them ad nauseam: diatoms? Those organisms that are in every body of water on the planet? Ah, yes. I can see it all coming back to you. Zooplankton encompass a diverse range of macro and microscopic animals. 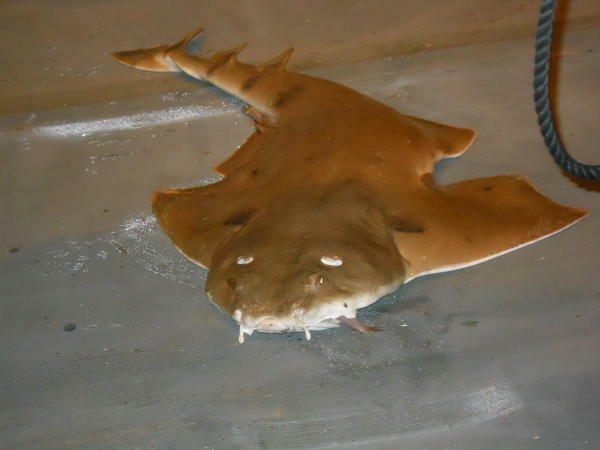 They generally eat the phytoplankton or one another. Examples include krill, copepods, jellyfish, and amphipods. 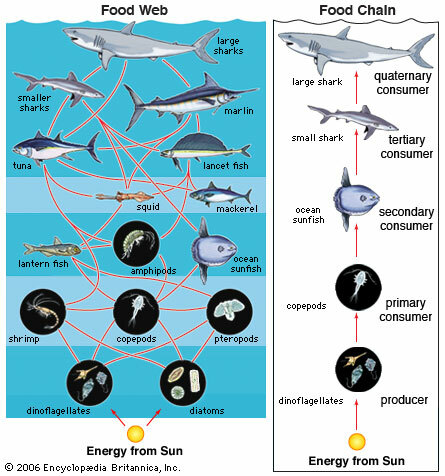 In the great food web of life, other organisms eat the zooplankton. 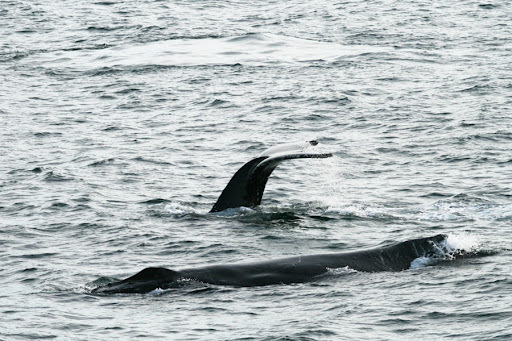 Among them was a pod of 50+ Humpback whales in the Barnabas Trough off of Kodiak Island. They were exciting enough that I went from being sound asleep to dressed and on the bridge in less than five minutes. 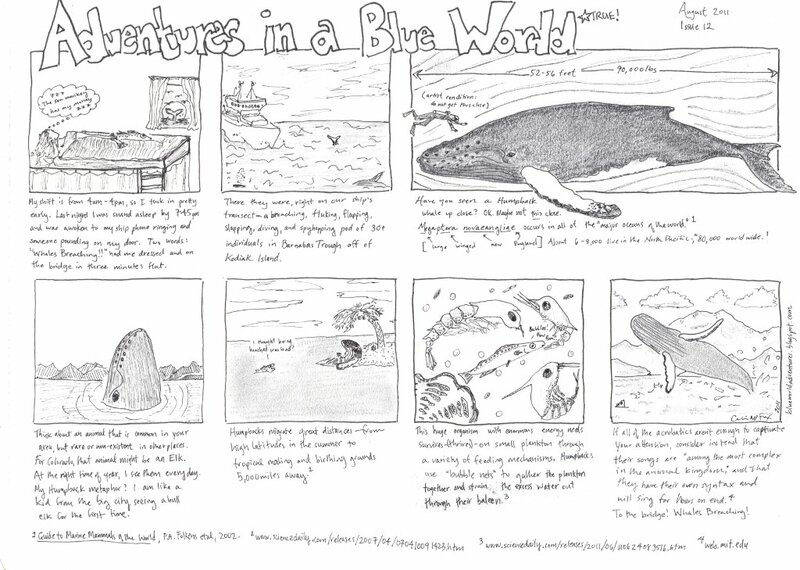 Issue 12, Humpback Whales: Better than any alarm clock I have ever known delves into these organisms (Cartoon citations 1, 2, 3 and 4). Our chief survey technician, Kathy Hough, took a lot of photos the following day as we traveled from Barnabas Trough to Alitak Bay. The three photos that follow and descriptions are courtesy of Kathy. 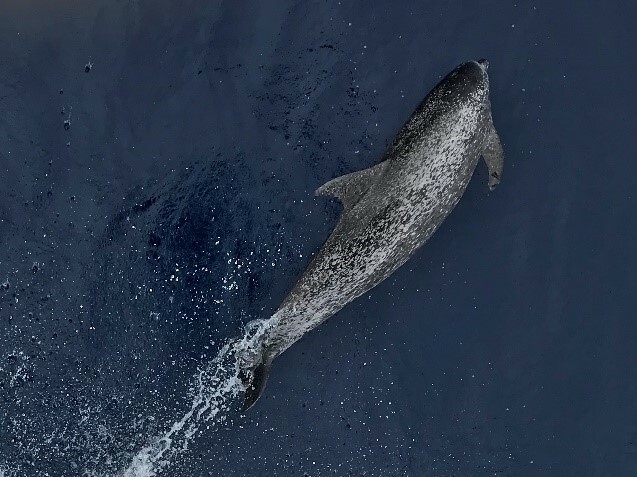 Whale tail: Individual humpback whales can be identified by the black/white pattern on the ventral side of the fluke (tail). The pattern is like a human’s fingerprint, unique to one animal. 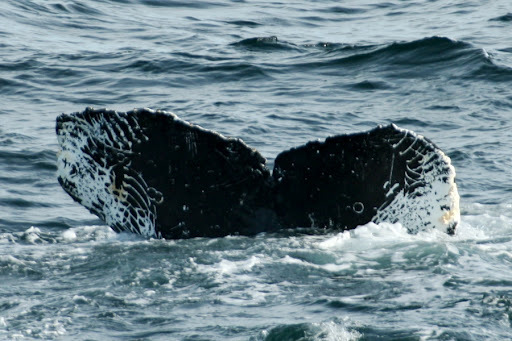 This Humpback was last seen in this area in 2004, and has not been seen since. The white marks on its fluke are from a killer whale attack! Kathy emailled photos of the whales to observers, and they were able to identify individuals! All hands on deck… 100+ Humpback Whales. Darin and Staci. 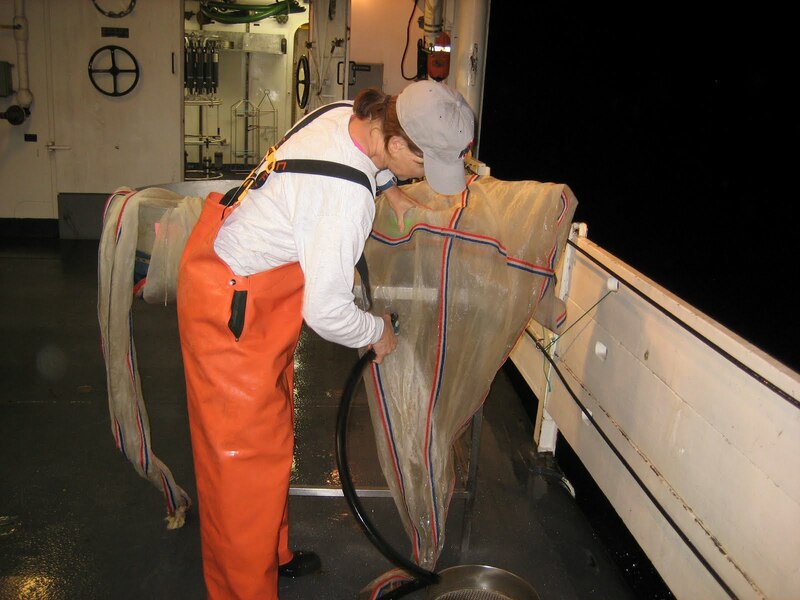 Our team of scientists sample plankton using a Methot net, which is fine mesh and captures macroscopic organisms. 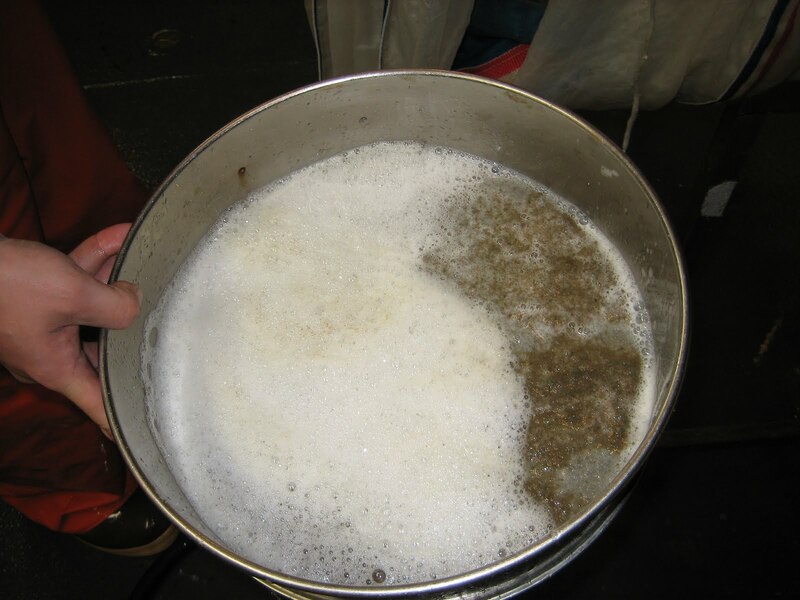 We sample plankton for the same reason that we physically trawl for fish: we need to make certain what we are “hearing” is what is down there, with a focus on the types and sizes of the plankton. 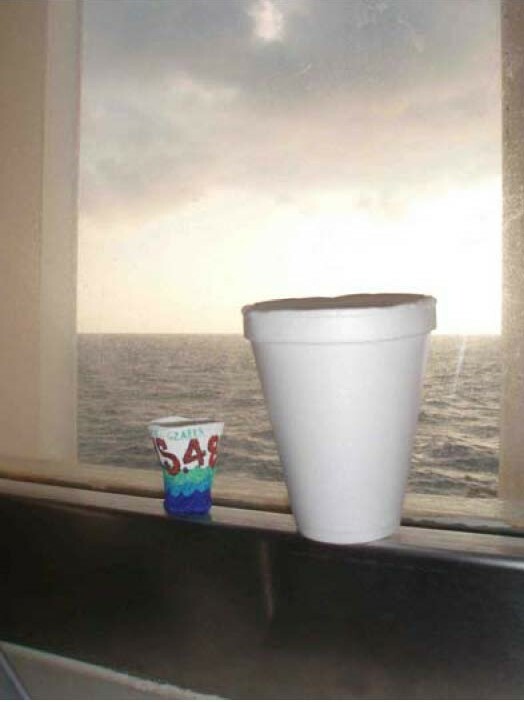 Additionally, knowledge about what and where plankton populations are will help with modeling the entire ecosystem. If you know where the food lives, its abundance and composition, by extension you have a much greater understanding of the predators, both pollock and whale. I try to spend time on the bridge every morning before breakfast. I bring up a cup of tea and watch the horizon lighten until the sun pushes its way up above the lingering clouds. This morning, I saw the green flash for the first time. The green flash is not a superhero. It is not a myth. 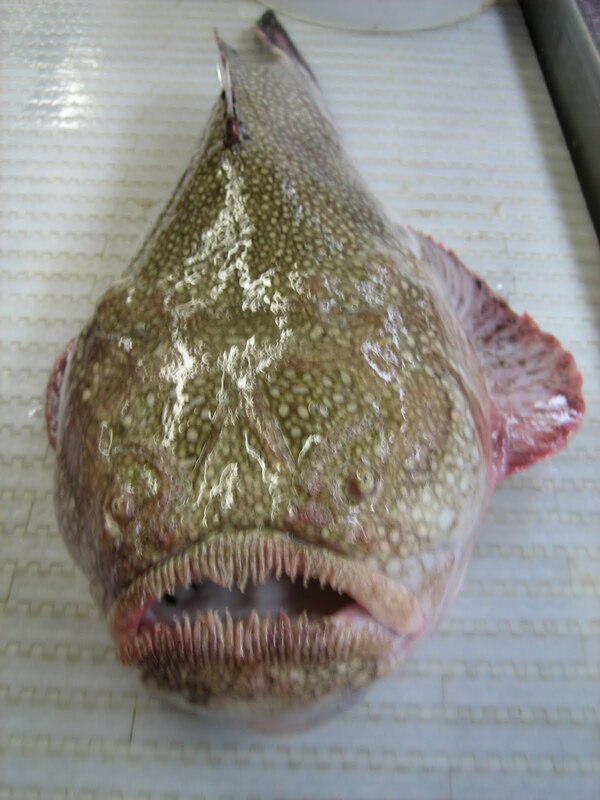 It is not a sailor’s fish tail. It is real. 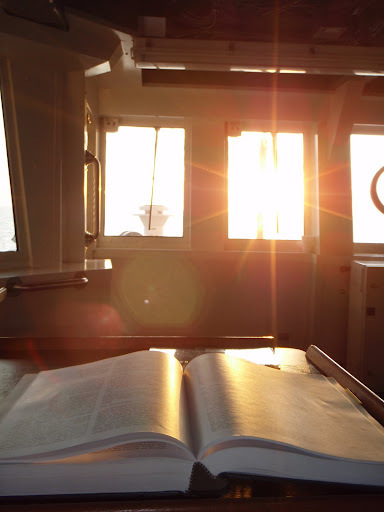 Furthermore, if you still don’t believe me, the green flash is in the “bible” of maritime studies, The American Practical Navigator (Bowditch, if you are on a first name basis). I was told by Ensign David Rodziewiczthat “if it is in Bowditch, it must be true.” So there. 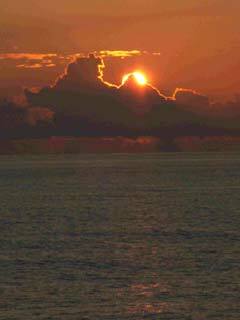 The green flash appears on the horizon just after the sun sets or just before it rises. For one moment on that spot the sky looks as if someone broke a green glow stick and smeared a distant florescent mark. As fast as it was there, it is gone. The name is appropriate: green flash. It occurs because light is bent slightly as it passes through the atmosphere (refraction); this bending is greatest on the horizon. Since light is made up of different colors with different wavelengths, the bending causes the colors to be seen separately. Bowditch says it is like offset color printing (nice metaphor, eh?). The red end of the spectrum is first to rise. The blue end of the spectrum is scattered the most by the atmosphere, leaving behind the momentary and memorable second of green. Evidently, to see the green flash is considered very good luck. I already feel very lucky. I am in one of the most beautiful places in the world, on a ship with interesting and intelligent people, driving around the Gulf of Alaska learning about science and occasionally checking out whales. If I can get luckier than this… well… wow. Tomorrow is the last day of our cruise, but I have a few more cartoons up my sleeves, so keep checking back. 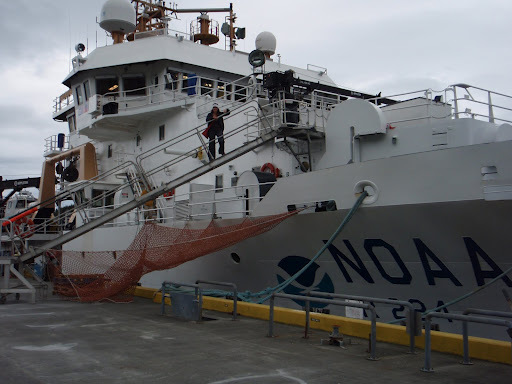 In the meantime, thank you to the incredible staff of the Oscar Dyson, the scientists of MACE, my rockin’ cohort Staci, and the NOAA Teacher at Sea program. We’re up to station #40 now and everyone certainly has their routine down. 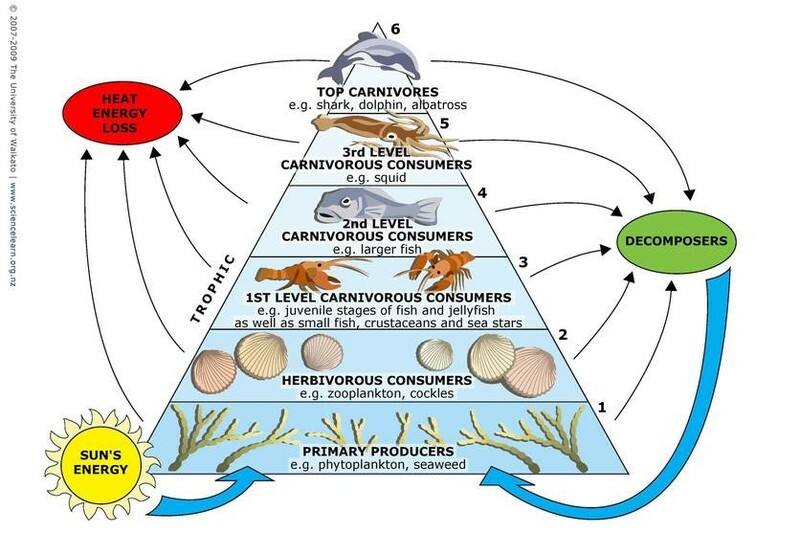 One type of sampling I have yet to cover is the microscopic life; the base of the food web. 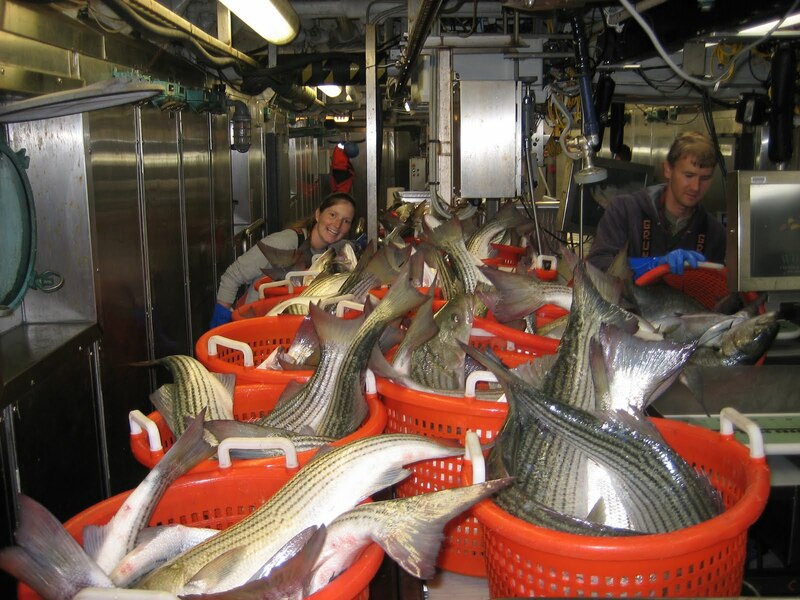 A look at the marine fisheries food web quickly reveals that in order to support the commercial fisheries as well as the vast number of marine mammals and ocean birds, there must be an abundance of phytoplankton and zooplankton available in the Bering Sea. Evidence of this food chain is demonstrated by dissecting the stomach of a salmon. 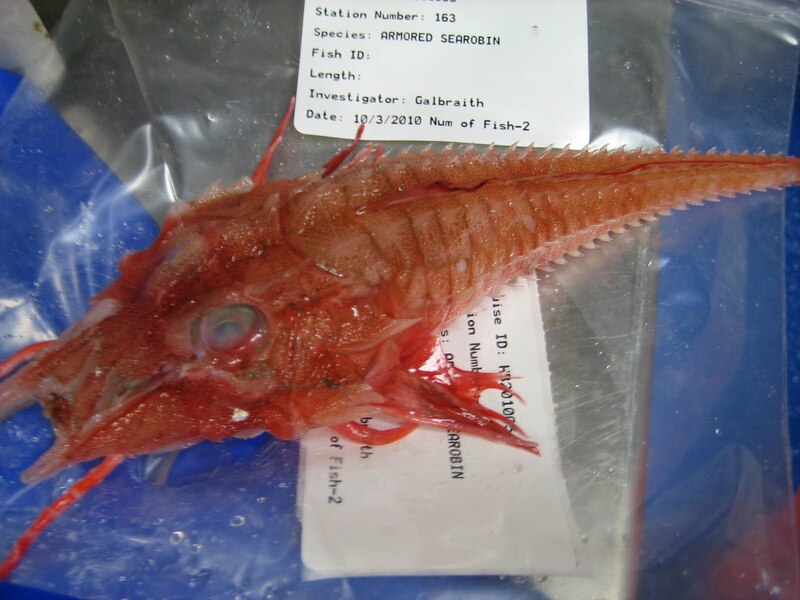 The sample (in the picture below) revealed that the salmon had recently dined on euphaussids (commonly known as krill). Before getting into how the zooplankton samples are collected, first let me go back and touch on the base of the food web; phytoplankton. 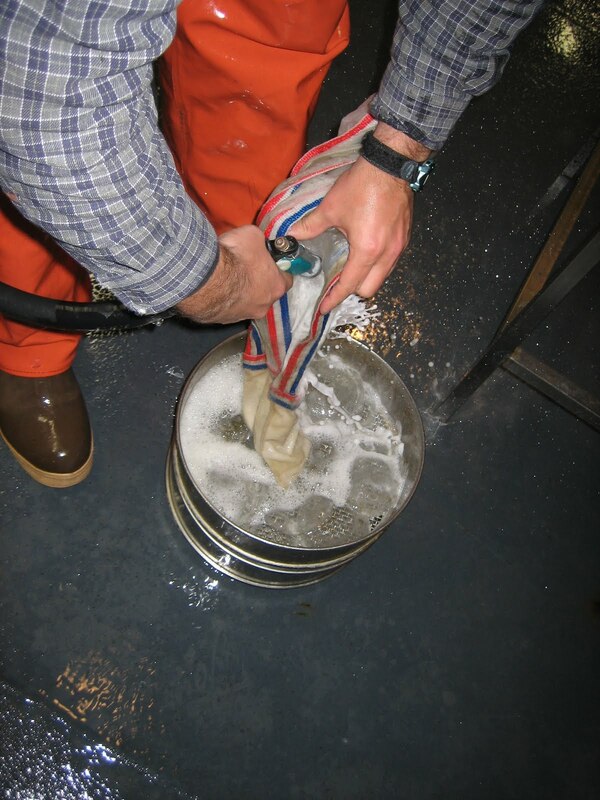 These samples are collected from the Niskin bottles on the CTD each cast. 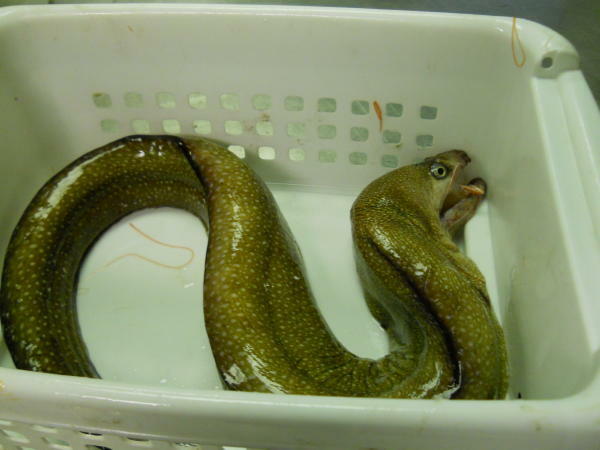 The samples are preserved with formalin and will be brought back to the lab for further analysis. 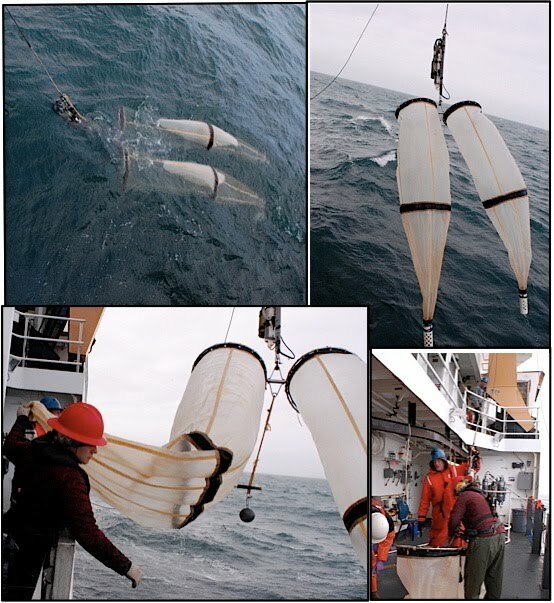 Now, back to the critters..
At every sampling station on the side deck and immediately after each CTD cast, zooplankton net tows are completed. There are three different tows being used for the BASIS survey. 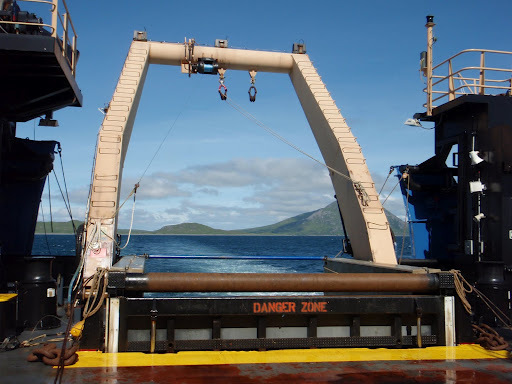 The first two are vertical tows where nets that are weighted are dropped to the seafloor and then brought back to the surface thus sampling a vertical water column. 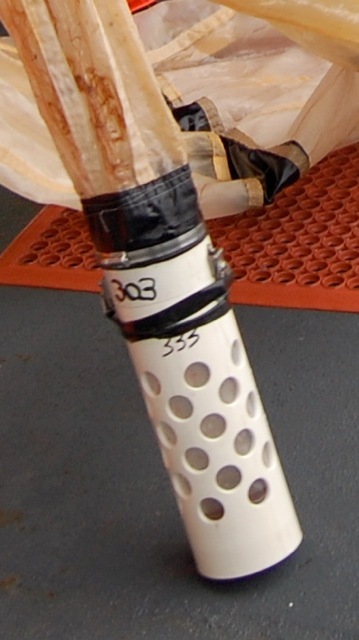 The pairovet, named from the fact that is was designed as a “pair of vertical egg tows” (designed to collect pelagic egg samples) has a netting mesh size of 150 microns. The net is simply deployed with a weight on the bottom. 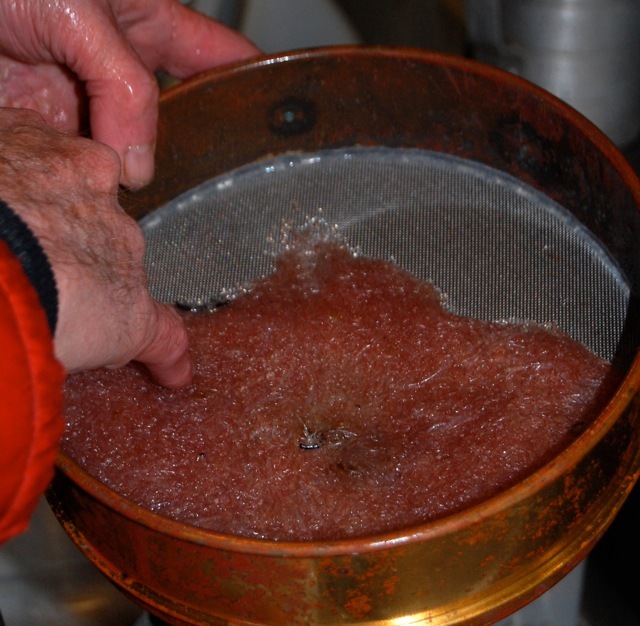 When it reaches the deepest part of the water column it is brought back to the surface collecting its’ sample. 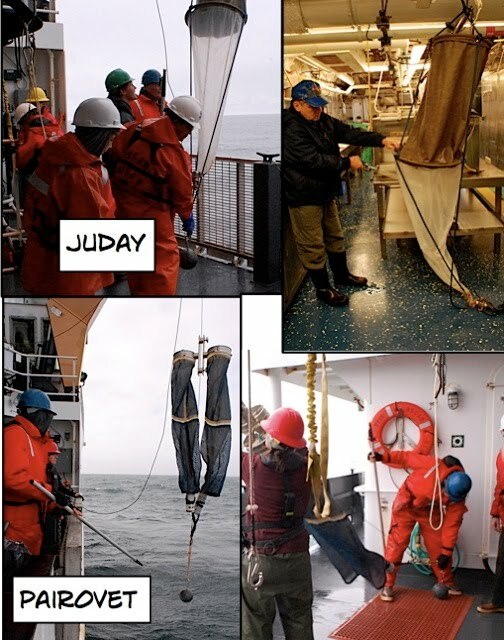 Another similar net with a 168 micron mesh size is named the Juday. 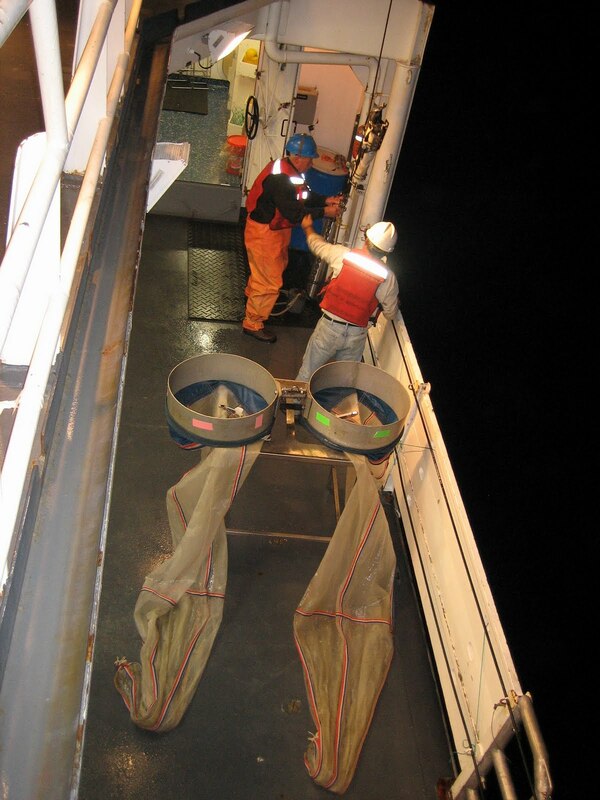 Once either of these nets is brought to the deck, it is washed down and anything caught is captured in the cod end (the name for the PVC bucket at the bottom of the net). The last type of tow that is completed for the BASIS survey uses the Bongo nets. This tow is considered an oblique tow since the nets essentially are lowered to about 5m from the ocean bottom and towed for a certain length of time. If you remember from the acoustics, in daylight hours the zooplankton migrate to the ocean bottom to hide from their prey. Since our sampling is done in daylight hours, the deep sampling depth is where we expect to find the highest density of zooplankton sample. The mesh sizes on the two nets of the Bongo are 335 and 505 microns. 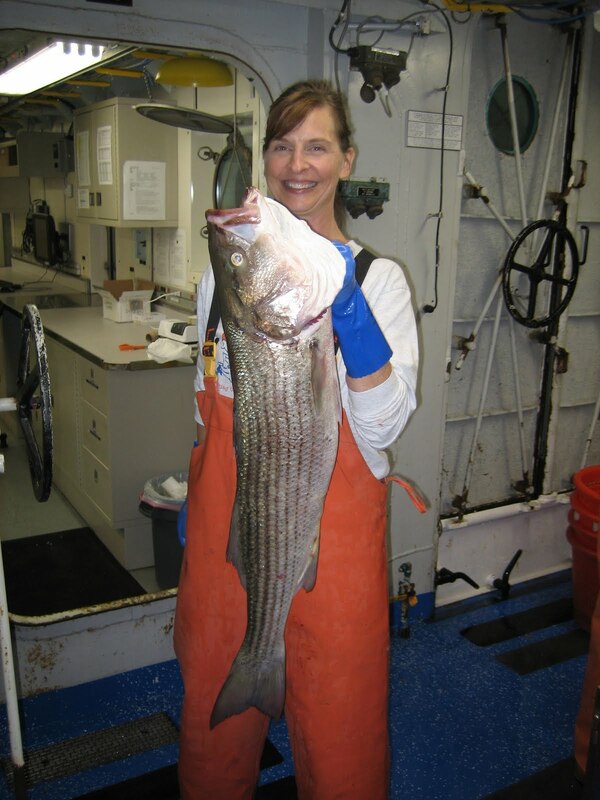 This allows for sampling of zooplankton of different sizes. 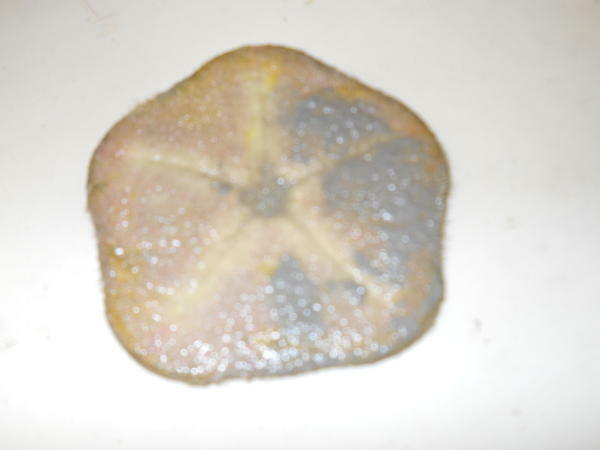 The samples are collected on board and then taken back to the lab for analysis. 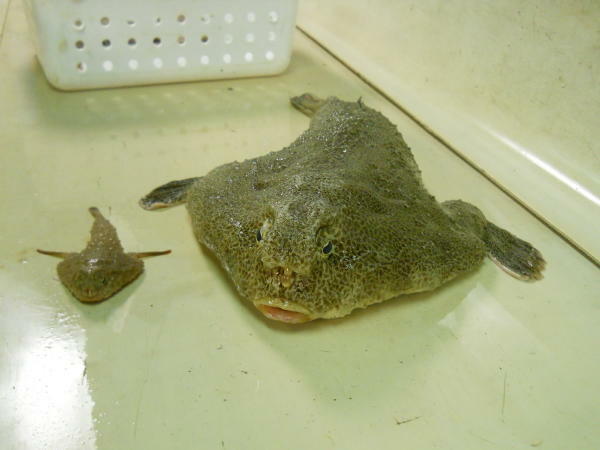 They are separated by species, counted and weighed. Biomass and species composition is determined for each sample. 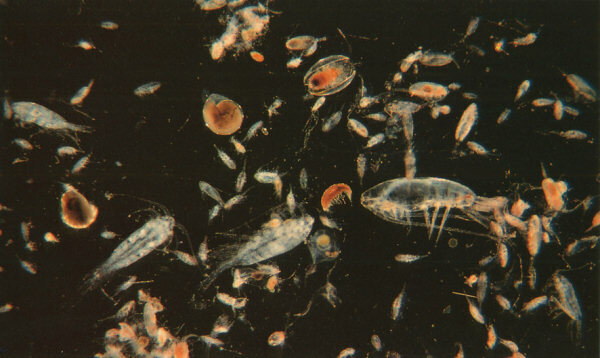 The majority of the zooplankton we have seen this cruise have been euphaussids and copepods of varying types. Oh where, oh where does the Internet go?? So I tracked down Vince Welton, our Electronic’s Technician for some help understanding why sometimes I can surf, and why sometimes I can’t…. Our Internet connection is via the geostationary satellite GE 23 at 172 degrees East. This satellite transmits over most of the Pacific Ocean (see a coverage map). Since this satellite is positioned on the equator, that means our receiver must look essentially due south for a signal. 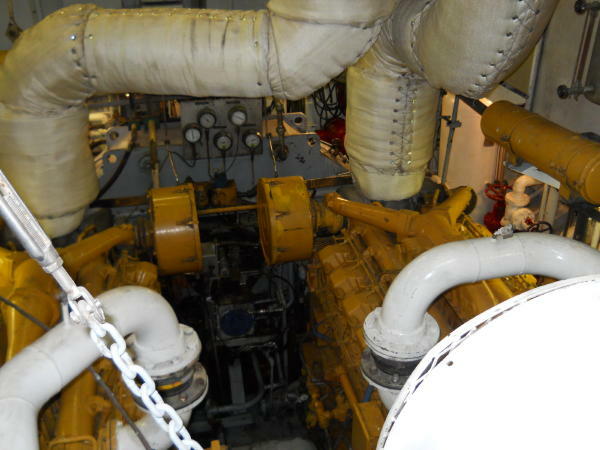 When our ship is northbound, the mast and stack of the Oscar Dyson simply gets in the way. Therefore… no Internet on northbound travels. The Oscar Dyson also has access to two Iridium satellites for communication as well as the GE 23. 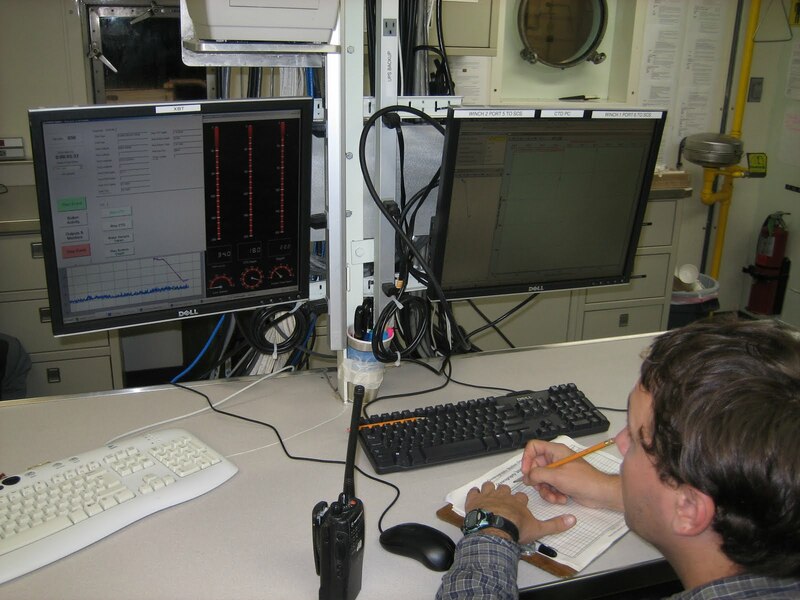 These are the SAT-B which can transmit both data and voice communications and the VSAT which only allows voice transmission. The ship can access this set of orbiting satellites when the GE 23 is unavailable due to course of travel or weather conditions. 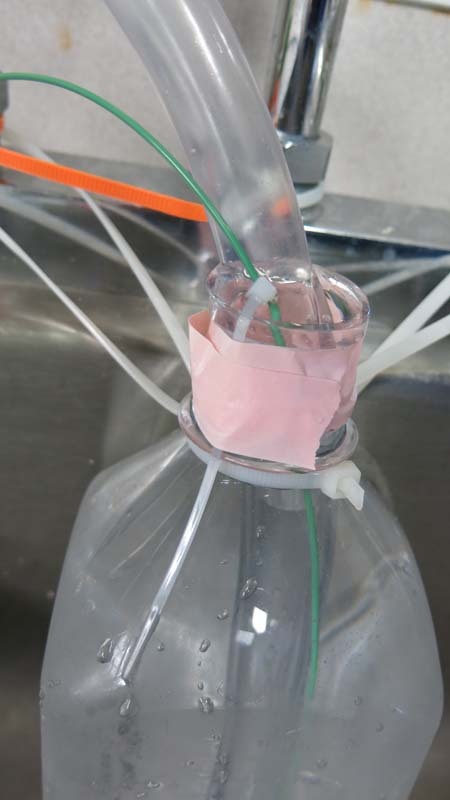 In the Oceanography lab, we have started our primary productivity experiments and chlorophyll analysis so learning these new procedures has been interesting and given me lots of ideas for some research topics for Edelberg’s class. 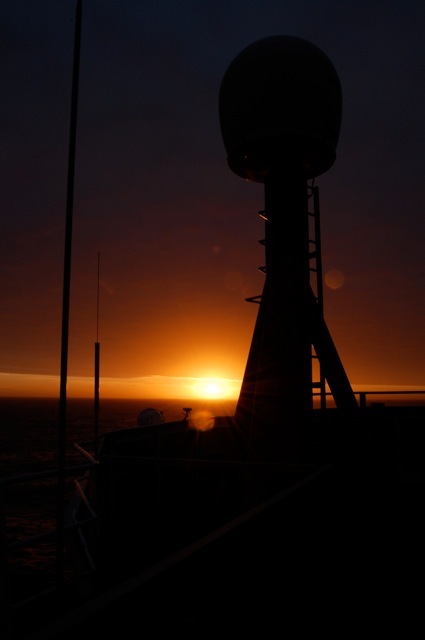 All in all, I am enjoying watching, learning and doing science here in eastern Bering Sea. One week left..